Marble annihilation brought to you by the third dimension. ere you aware that blasting away shiny marbles fell into its own genre? I didn't, but now QuantZ has taken this genre and turned it on its head. Marble-popping, as it's called, has been given a new dimension but deep down it is still the same OCD-inducing game type many casual gamers have come to obsess over. It's an intriguing game with a revolutionary idea that takes something as simple as clearing marbles by matching sets along a canal and translates it to the third dimension. It feels and plays just as you would imagine a 3D Bust-A-Move to work, except you have control of both the way the marbles are clustered together and the floating cube they call home. a little Tengwar just for kicks.Without any clicking, the mouse controls the way the cube rotates in free space. I found this fascinating when I first installed the game. My first instinct was to play with the controls a bit. I moved it as quickly as possible, and the result was spectacular! All the marbles, or QuantZ, that had previously been sitting neatly on each face of the cube were ejected away from the cube momentarily only to fall back to the surface. This simple discovery led to more entertaining experiments. What happens when you suddenly jerk the cube rather than spin it maniacally? How easily can you control where they land if the cube is no longer a cube, but a multifaceted pyramid? Strange things can happen, especially since some QuantZ seem to stay permanently fixed in their places. This is the kind of variety that makes for many hours spent trying to understand this strange world the QuantZ live in. 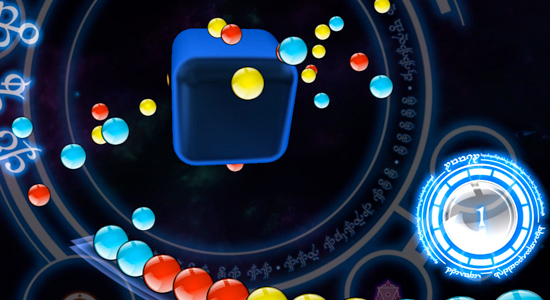 To play the game you must shoot other marbles at the cube configuration. Like Zuma and Luxor, you can destroy a sequence — or in this case a cluster — of marbles by connecting four of the same color or more. Should they surround a marble of another color, it will be shot into free space where it lingers briefly and then subsequently returns to the surface. As it falls, a small shadow appears so that you may turn the cube and control where it lands. In a smoldering haze, all nearby like-colored marbles will fade away. There are three game types: Strategy, Puzzle and Action. The first lays out twelve worlds for you to visit, each with a different theme to the challenges therein. You can think of each challenge as an achievement of sorts, and they range from time trials to blasting away QuantZ in a certain number of chains. The second reminds me of an old NES game titled Puzznic, where each stage presents a unique challenge varied by changes in terrain, arrangement of marbles, and the necessity to understand how to plan out chains of devastation. Once the first set of challenges are completed, you can unlock the third mode of play — Action. I will be honest, I was very skeptical about this Action mode. The only difference between it and the other modes is that you have no control over when the outlier marbles are propelled toward your cube. Beyond that you still progress through twelve different worlds, each with their own theme of challenges. When a marble is within range, it sits for a moment in your field of view giving you just enough time to choose a landing zone. challenge varied by changes.In terms of casual games, QuantZ has definitely reinvented the marble-popping and puzzle genres. It includes enough puzzle variety to keep you firmly entrenched for any amount of time. I am particularly fond of the art style, which is modeled in a mystical runic format mixed with Greek ABCs and a little Tengwar just for kicks. And more than enough lens flare. Even the cursor has lens flare. My only other issue is the strange menu music. The angelic female voice fits the overall feel perfectly. It complements the mystique — that is until you hear this very deep voice blurt out "QuantZ!" at the crescendo. Honestly, I laugh every time I hear it. Nitpicking aside, this is a casual game and success is typically based on addictiveness. Like most of them out there, anyone would be able to find this game fun and enlightening. I recommend trying the demo available online to see if captivates you. But if you are the type who resonates well with these games, then prepare to be very busy for several hours.